It's no secret that I'm no chef. I'm a total bust in the kitchen, and to be honest, it doesn't bother me one tiny bit. This lack of domestic skills that I'm referring to includes my inability to bake, but that doesn't stop me from trying. I used to make the dough for sugar cookies, and then I wised up and started using the pre-made dough. Even that was a struggle for me because I could never get it rolled out. I was ecstatic this year when I came across, pre-made, pre-rolled sheets of dough. 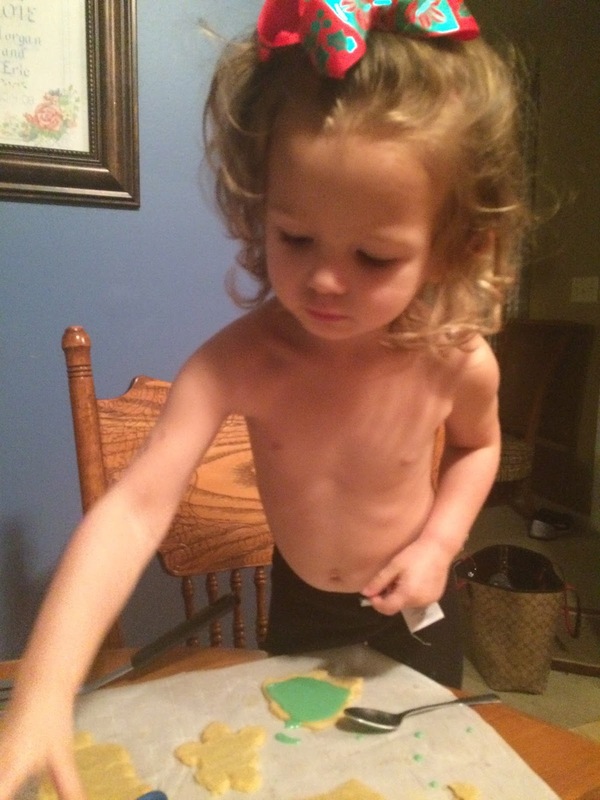 All we had to do was cut out shapes and bake…that's my kind of baking, ya'll. So, Monday night after unloading all the groceries and eating dinner, we got busy baking cookies for Santa. As you will soon see, these cookies are exclusively for Santa because I'm not sure they are edible by the time we are done. Ha! I made my own icing this year, but it was too runny. 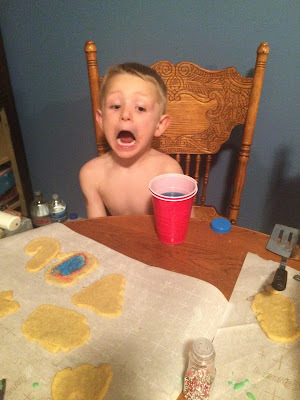 There was food coloring EVERYWHERE! 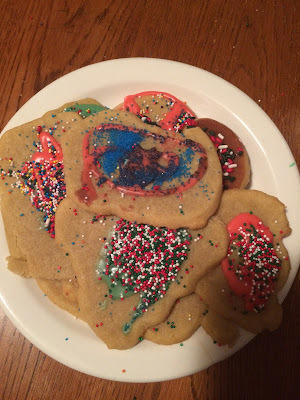 In fact, between my icing mishap and all the sprinkles the kids used, it took longer to clean up than they whole activity. Here was the end product. Again, don't judge…and certainly don't eat! After one too many meltdowns, we put the kids to bed, watched TV, and moved the elf. He lost the "snowball" fight with the one-armed Nutcracker. Poor decoration has seen better days.